Hi Dolls :) I hope you are all enjoying the beautiful weather outside. I know it’s been a while since I last posted, and trust me, I have my reasons for that. I’ve been going through a couple of things that are quite depressing. As much as I want to share my life with you all, I would like to focus on the positive side of my life here on this blog. So today, I’m going to be talking about my prom experience and how to look glamorous without breaking the bank. I believe for most high school girls like me, prom is a big deal. I’ve been looking forward to it all throughout high school. I was determined that I had to look super glam at my prom. I didn’t really look into prom dresses until earlier this year, that’s when I realized how expensive dresses could be. I couldn’t believe that some people are willing to spend more than $500 on a dress that she is only going to wear it once. Also, I read it somewhere that on AVERAGE, people spend more than $1000 on prom! That is absolutely insane! I only spent around $300 in total. Now, I bet you’re anxious to hear how I managed it. I would like to share with you a couple of tips as well as my experiences with certain stores. Tip #1: Know what you want! I know this is such a cliche thing to say, but it’s absolutely crucial. There’re so many kinds of dresses out there, either it be short, long,-high-low; mermaid, A-line etc. When I say you should know what you want, I don’t mean you have to know it right away. When I was going prom dress shopping, I had absolutely no idea what kind of dresses I wanted. What I did and I recommend you girls to do the same were to go into a dress store like BCBG, and try on different kinds of dresses. color, what length and what kind of shape of dresses would look good on you! After hours and hours spent in dressing room, (remember to snap lots of pics even if you have to do so sneakily) I was certain I wanted a long dress. It could be A-line or mermaid, and I wanted it in red! Now that I had a clear idea what I want, it’s time to go shopping! Tip #2: Shop your dress online! Tip #3: Look up red carpet photos! Lots of them! I have always been passionate about red carpet dresses. My all time favorite was Nina Dobrev’s red mermaid dress that she wore at 2011 Emmy Awards. That overall look was just breathtakingly beautiful! Anyways, enough of me drooling over her beauty. She’s an immortal after all, of course, she’s stunning! What I meant by looking up celeb pics was to get inspiration on how to style your dress. It’s quite pointless to look at their dresses since they’re all sponsored by top couture houses. But it’s really beneficial to look at how they style the entire look. My dress is somewhat similar to Nina’s, so I was originally going for silver accessories. My favorite store to get clutch, shoes etc is Aldo. Their clearance section is every budget girl’s best friend. I got a pair of six inch for around $40. In the end, I settled for gold accessory which cost me less than $30 at Aldo. That doesn’t mean you should skip the red carpet step. It also helps with makeup, hairstyle etc which I will be talking about in a future post. Otherwise, this post will go on until the end of the world…..
Here’re some pictures that I have taken prior to prom and at prom. Hope you enjoyed this post and found it helpful. To sum it up, if you have a special occasion to go to, always plan your outfit early. Try on lots of dresses and be open-minded. Keep browsing on-line and read lots of reviews. But then again, don’t be too conservative and go ahead, take some risk. Never give up, you have to believe that there’s a perfect dress out there somewhere that is meant to be yours! You looked beautiful for prom! These are such great tips. Prom shopping is really hard, and I felt like I tried on a million dresses before I found one. I seriously don't know how people can spend 500+ on one dress for prom, but they did at my school too. My dress definitely didn't break the bank, and I loved it just as much. Thanks for following - I'm going to follow back with Bloglovin'! You look gorgeous in that dress! I talk about how much I miss my senior prom all the time! I had a blast, I have to admit I was one of those people that I payed probably around 700$ for prom related costs, but that was for the whole weekend, after prom a bunch of my friends and I went down the shore for that weekend. You look absolutely gorgeous in that dress! And great article-prom has notoriously been so expensive! I LOVE the dress you chose! It's very old Hollywood glamourous (my favorite) and you would never guess that it was only $90. Also, I agree with you that it's ridiculous what some people spend on dresses they will wear only once! You look fabulous!! Red is such a pretty color on you and the style is so classy. I hope you had fun at your prom! I remember mine from almost 7 years ago =/ and it really was such a fun and exciting night. And Aldo's clearance...to die for! They always have great selections when I shop there. wow your dress is absolutely gorgeous! you look fabulous in it! so pretty, and great tips! Aw red is such a pretty color on you! 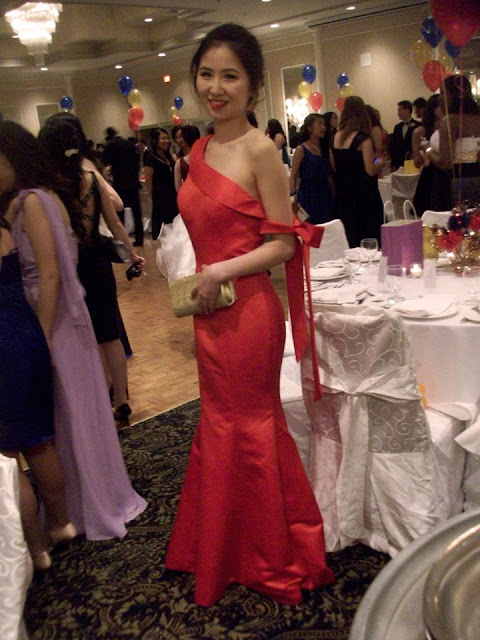 My dress ripped at my own prom-- disaster! $100?!?! That's crazy!! You looked very elegant, hope you had a wonderful time!